Hope you are having a wonderful weekend. Are you shopped out yet? Are you still having left overs??? LOL....I know everyone must be hustling and bustling, and I have been going through my stash I have been collecting for over 10 years, so I have been sifting through things and going to be giving a ton of stuff away to some lucky crafter, who can pick it up from my home, as it's boxes worth of books and scrapbook products. Anyway, today I am sharing a sweet, sweet little Birthday card, which I made with My Favorite Things stamps. By the way did you check out Kim's Blog? They already started the sneak peeks for the December release...talk about drool worthy creations!!!! 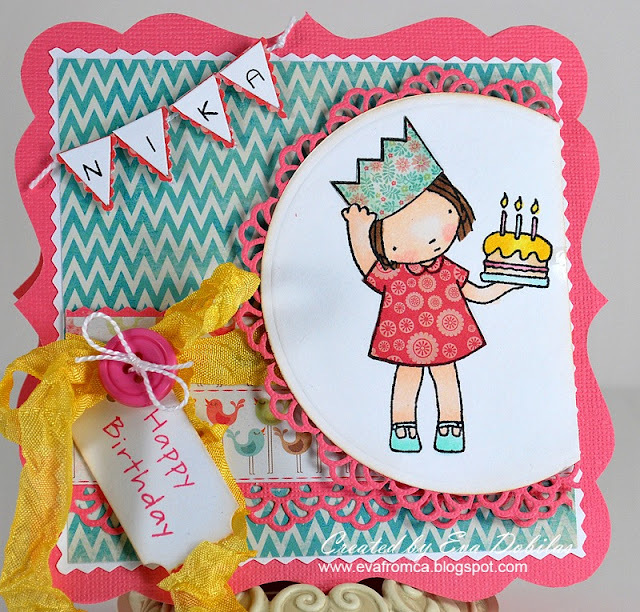 I actually got an order from someone to make a customized card for her little girl, who just turned a year old, so I knew this little My Favorite Things stamp would be PERFECT and here is what I came up with using the sweet My Minds Eye papers. Isn't she just TOO CUTE???? I certainly used quite bit of My Favorite Things products on this. Here is the list, in case you like what you see. I also used PTI's ticket die, which is always fun to use. The card shape itself is another Samantha Walker Silhouette Digital cutting file. Well, that is it for the day. Hope you have a wonderful Sunday!